Our Seam Tapes are used in a variety of seam applications. We offer both 2 LAYER & 3 LAYER Seam Tape. Contact us and we will help you find the best solution for you! The most common use for our Seam Tape Adhesive Films is to seal a sewn seam, and many of our tape products may be color matched for a more finished appearance. • APPAREL : Adhesive Film’s Seam Tapes are utilized in a variety of seam sealing applications. Depending on the end use application, the tape may consist of two or more layers. The most common use for our seam tape is to seal a sewn seam—making it waterproof. Many of our Seam Tape products may be color matched for a more finished appearance! • FOOTWEAR : Seam Tape is used to waterproof seams in booties, ski boot bladders, hiking boots, and military footwear. The tape may be two or three layers depending on the substrate being sealed and the intended end use. • FIRE PROTECTION / EMS : Seam Tape is used over the sewn seams to prevent water from penetrating the seam. We have tapes that are able to withstand extremely high heat and moisture—as well as offer resistance to blood-borne pathogens. • MILITARY : All Adhesive Film’s Seam Tapes meet or exceed the Mil Spec requirement for the specific application. Some of the current uses of seam tape in the Military are: ECWAC Jackets, Tents, Boots, Ponchos, Fire Suits, Flight Jackets, Medical Gowns, Protective / Chemical Suits. • TENTS : Critical areas of application would be to seal the sewn seam of the tent floor to ensure waterproofing and the fly opening. • CHEMICAL PROTECTION : Adhesive Film’s Seam Tapes have a high resistance to chemicals and other toxic or corrosive substances. The tapes are used to seal the seams in these protective garments. Depending on the end-use requirements, the tape is applied to either the outside seam or the inside seam. • AUTOMOTIVE : Adhesive Film’s Seam Tapes can be used to seal the sewn seams in the seats, head and arm rests to prevent the interior foam from passing through the stitch holes. Our seam tapes can also be used to seal the seams of a convertible top or an air bag. Adhesive Films, Inc. offers industry leading Seam Tapes at competitive pricing that will stand the test of weather and time! Browse through our Seam Tape Instruction Manual for more information! Even the most expensive waterproof fabric used in outerwear or outdoor products will fail to keep you dry if the seams aren't strong. In fact, a strong, reliable seam tape is probably the most important component of any waterproof product, from Rain-Gear to Tents or Boots, and more. Do you have an application that you don’t see mentioned here? Contact us and we will work with you to find a solution! • APPAREL: Adhesive Film’s Seam Tapes are utilized in a variety of seam sealing applications. Depending on the end use application, the tape may consist of one, two or more layers. The most common use for our seam tape is to seal a sewn seam—making it waterproof. Many of our Seam Tape products may be color matched for a more finished appearance! • FOOTWEAR: Seam Tape is used to waterproof seams in booties and inserts; ski boot bladders; hiking boots; and military footwear. The tape may be two or three layers depending on the substrate being sealed and the intended end use. • FIRE PROTECTION / EMS: Seam Tape is used over the sewn seams to prevent water from penetrating the seam. We have tapes that are able to withstand extremely high heat and moisture—as well as offer resistance to blood-borne pathogens. • MILITARY: All Adhesive Film’s Seam Tapes meet or exceed the Mil Spec requirement for the specific application. Some of the current uses of seam tape in the Military are: ECWAC Jackets, Tents, Boots, Ponchos, Fire Suits, Flight Jackets, Medical Gowns, Protective / Chemical Suits. • TENTS: Critical areas of application would be to seal the sewn seam of the tent floor to ensure waterproofing and the fly opening. • CHEMICAL PROTECTION: Adhesive Film’s Seam Tapes have a high resistance to chemicals and other toxic or corrosive substances. The tapes are used to seal the seams in these protective garments. Depending on the end-use requirements, the tape is applied to either the outside seam or the inside seam. • AUTOMOTIVE: Adhesive Film’s Seam Tapes can be used to seal the sewn seams in the seats, head and arm rests to prevent the interior foam from passing through the stitch holes. Our seam tapes can also be used to seal the seams of a convertible top or an air bag. Adhesive Films, Inc. Offers Industry Leading Seam Tapes at Competitive Pricing and Our Products Stand the Test of Weather and Time. Even the most expensive waterproof fabric used in outerwear or outdoor products will fail to Keep you dry if the seams aren't strong. 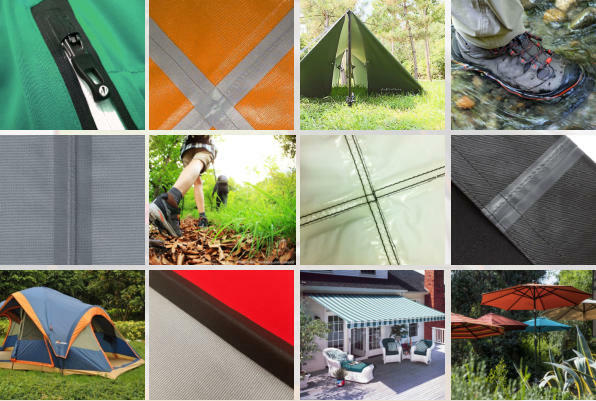 In fact, a strong, reliable seam tape is probably the most important component of any waterproof product, from Rain- Gear to Tents or Boots, and more.